CLOVIS, Calif. (KFSN) -- Two Clovis home burglary suspects didn't realize they were on camera when they broke through a sliding glass door and into a master bedroom. The suspects are seen on camera breaking the sliding glass door to the master bedroom, and stealing property. No one was home at the time. The Clovis Police Department, in a Facebook post, say a home surveillance camera from the residence caught them on camera. The residential burglary took place on November 4th at about 8 pm at a home near Bullard and Fowler in Clovis. Both suspects are described as black male adults. The first suspect is about 5'11 - 6'0, about 180 lbs, wearing a light colored hoodie, dark skinny jeans, gloves, and Jordan shoes. 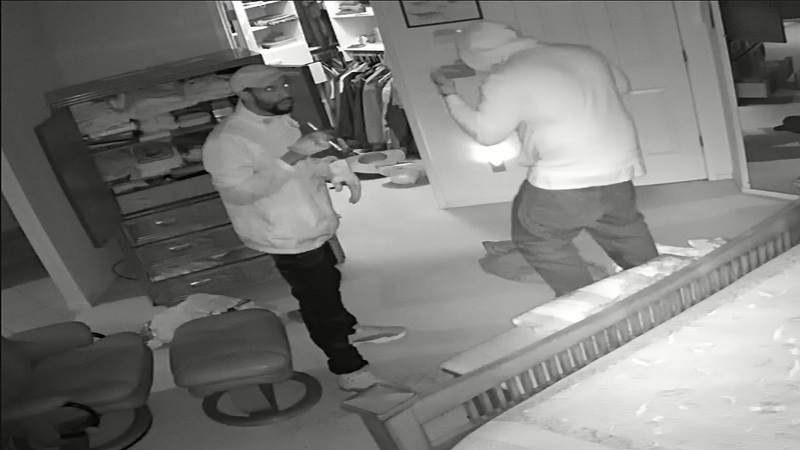 The second suspect is about 6'0 - 6'2, about 230 lbs, with a beard, eyeglasses, and wearing a light colored hoodie and jeans, and Jordan shoes. If you have any information regarding this case or the identity of these suspects, please contact the Clovis Police Department at (559) 324-2556, or email ClovisPolice@cityofclovis.com.